KNC Granite provides granite fabrication and installation service to help you design your kitchen with best granite countertops in Maryland.We have a large collection of granite countertops in MD warehouse. I’m giving KNC Granite 5 star for their service they provided me. They have installed granite for my new home. They were very responsive. They also got the job done timely. Highly recommended. I had a great experience working with KNC Granite. They have a great selection of marble slabs that I viewed in their showroom and picked exactly what I wanted. What are the advantages of granite as countertop material? Because granite crystals are interlocked, it makes it harder to take apart. This makes it ideal as material for countertops because it does not easily scratch, even if you use a knife on it. It is not proof against a sledgehammer or other deliberate attempts to cause damage, of course, but otherwise it is hardy enough to last as long as the house remains standing, and perhaps much longer than that. This interlocking structure also reduces the porosity of granite to the point that it is generally stain proof, so it is easy to clean and sanitize. However, many granite slabs may have micro fissures that will cause small irregularities to appear on the surface. Commercially prepared granite is sealed to smoothed out these irregularities and to make it even more durable and low maintenance. At most, you may need to reapply the sealant once in a while. Learn more about Granite from Geology.com. No two granite slabs are exactly alike, even if they have the same composition. Nature rarely creates something that is not unique, which is why natural stone is such a distinctive part of any décor. Granite is available in an infinite combination of colors and patterns, depending on its mineralogy. A slight variation in the percentage of feldspar or mica in the mix can produce a completely different appearance. While white, pink and gray are the most common colors, you may encounter some orange, blue, and green in there as well. Check out How its made Granite Video to learn more. You may decide on a slab because you like the color combination or the pattern, but it does not hurt to know why it happens to be that way. Here are the crystals that determine the color of your granite countertop. See if you can identify each one. Granite is made up mostly of quartz, a colorless crystal that may take on the hues of other minerals around it clearly or through a smoky haze. It fills the gap between other crystals, but since it is colorless, it does not dominate as the primary color. What it does do is make the rock shock-proof, heat-proof, and resilient. Running a close second to quartz in quantity, feldspar creates the color combinations and striations peculiar to granite. It can have an endless variation of pink, yellow, orange, and blue hues. When the feldspar is predominantly dark, you get clack granite. Mica lends a silvery or metallic sheen to the slab, but while the underlying color may also be silver, mica can be violet, pink, brown, or even black. A shimmery, dark-colored granite slab will probably have a higher than average concentration of mica in the mix, unless the quantity of dark feldspar effectively overshadows it. One of the most familiar type of granite is the salt and pepper look, and that is created when there is a good amount of the gray horneblend crystals in the mix. The best features of granite come naturally, and while design has no practical value, it does lend certain panache to an otherwise functional feature such as a countertop. The sheer variety of unique slabs to choose from makes it an easy favorite for interior decorators and homeowners alike. Last, but certainly not least, a big advantage of granite for countertops is affordability. It is not the least expensive of countertop materials, but it has far more to offer. For one thing, it can stand more abuse and requires less maintenance than tile or wooden countertops. For another, it is much easier to install a granite countertop than tiles. Finally, it is far safer to have granite as your kitchen working area than any other countertop material because of its relatively non-porosity. Another good reason to choose granite is it is less expensive than marble. However, with the right markings and polishing, granite can easily be mistaken for its more expensive cousin. If you are striving to create a high-end look, but your budget simply will not accommodate marble, granite is your best possible option. In addition, granite is much more durable than marble, so you are hitting two birds with one stone. You get the look of marble, but not the problems that go with it. 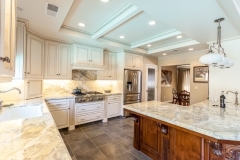 There is so much to like about granite countertops that it is no wonder that it is the top choice of architects, interior designers, and homeowners. Your biggest problem is choosing just the right one to go with your décor.